The Council on Public Higher Education (COPHE); is pleased to join Governor Nixon in determining ways to link additional state funding for public universities to outcomes that benefit Missouri students, employers and the state as a whole. “We appreciate the Governor’s leadership of this effort and are excited about its potential to further strengthen public higher education,” said COPHE Chairperson Dr. Brady Deaton. State funding for higher education should be based on measurable criteria that encompass statewide goals such as increased graduation rates and goals unique to the mission of each institution including, for example, research and outreach at the University of Missouri and Lincoln University. COPHE is committed to working with the Governor and the General Assembly to develop an effective funding system that will recognize and reward improvement on measures that benefit students, employers, and the state as a whole. We believe that higher education is critical to the future of our state and the well-being of all Missourians. 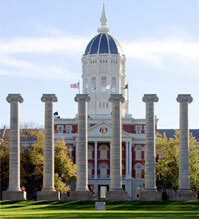 The Council on Public Higher Education (COPHE) is the association of Missouri’s 13 public universities. Dr. Brady J. Deaton is Chancellor of the University of Missouri and serves as Chairperson of COPHE.